During the prologue to The Screaming Skull, a mysterious narrator warns us that this film is so terrifying, so overwhelming, that it just might kill us. However, the narrator assures us, the studio is prepared to offer funerals free of cost to any movie patrons who might “die of fright”. After witnessing the film itself, which parades many traditional horror elements artlessly combined in a fit of mediocrity, I have to wonder – does this offer apply to death by boredom? The Whitlocks -- Jenni (Peggy Webber) and Eric (John Hudson) -- are apparently happy newlyweds that have just arrived home to Eric's house, which it is quickly revealed, originally belonged to his late first wife. However, shortly after arriving, Jenni suspects she is being victimized by the first Mrs. Whitlock's ghost – particularly her skull, which seems to be chasing her everywhere. Unfortunately for Jenni, the real culprit may not be supernatural after all, and, in fact, may be living very close indeed. While the film as a whole is strikingly unimpressive, the horror elements used to create the setting are carefully crafted, an exercise in precision. The house is large and spacious, overwhelming the characters inside and, at night, creating a “perfect” setting for a haunting. The doors slam, the shutters crash, the shadows play against the wall (since, of course, the lights are not currently working). There's even a really creepy portrait of the late wife hanging on the foyer wall. It just doesn't get any spookier – at least in theory. The problem with this elaborate set up is that, even during the peak of the haunting, there is never an established threat. Sure, there's possibly a ghost running around, but it hasn't attempted to do anything more malevolent than bounce a skull up the door. Rather than creating a physical threat, which the ghost is obviously ill equipped to do, The Screaming Skull attempts to create a mental threat by quickly revealing Jenni's back story. After watching her parents die in a boating accident, Jenni was so overcome with guilt and grief that she went temporarily insane and was committed to an institution. Now rehabilitated, the stress of this situation may just cause a relapse, forcing her back into the hospital. However, while this situation does put Jenni in some kind of danger, the situation is not tangible enough to actually produce any kind of concern in an audience. Of course, the biggest flaw in The Screaming Skull is that the antagonist, when all the intrigue is said and done, is exactly as the namesake implies: a skull. And the fact of the matter is, no matter how you look at it, a skull just isn't that scary. Even during the final scene, when the skull latches onto Eric's throat and chews him to death, it's still just a skull. The idea of such a thing being threatening is more absurd than terrifying. It is this sentiment that really taints most of the film and its makers’ attempts at fright-making. 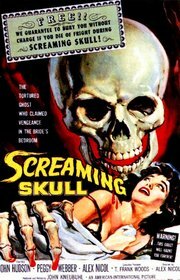 At sixty-seven minutes in length, The Screaming Skull is about an hour too long. With very little to recommend it, other than a few instances of careful craftmanship, Skull fails to live up to its prologue's promises. There's only one way someone is dying watching this film, and it's not by fright. Submitted by Paul Christman (not verified) on Thu, 2012-01-26 10:59. I was only nine when I watched SKULL on a little black and white tv, and it scared the ever-living Christ out of me! I'm fifty now, and today's horror films are about as scary (in my opinion, anyway) as watching squirrels chase each other up a tree. Perhaps I'm just jaded in my middle age, but give me an old Roger Corman horror flick any day instead of another installment of Wes Craven's lame Scream franchise.